The data_properties() function can be used to calculate the morphological properties of a single source in a cutout image. data_properties returns a SourceProperties object. Please see SourceProperties for the list of the many properties that are calculated. Even more properties are likely to be added in the future. If you have a segmentation image, the source_properties() function can be used to calculate the properties for all (or a specified subset) of the segmented sources. Please see Source Photometry and Properties from Image Segmentation for more details. Let’s extract a single object from a synthetic dataset and find calculate its morphological properties. 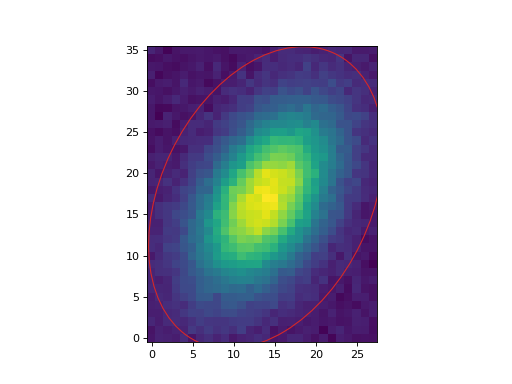 For this example, we will subtract the background using simple sigma-clipped statistics. This subpackage contains tools for measuring morphological properties of objects in an astronomical image. data_properties(data[, mask, background]) Calculate the morphological properties (and centroid) of a 2D array (e.g. gini(data) Calculate the Gini coefficient of a 2D array. © Copyright 2019, Photutils Developers. Created using Sphinx 1.8.5. Last built 19 Apr 2019.